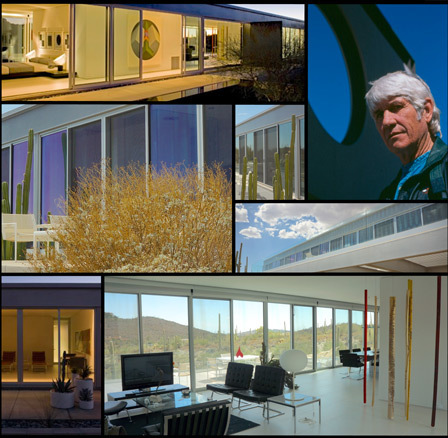 “Good architects know how to site buildings,” asserts Michael P. Johnson, the architectural designer of the beautiful Ellsworth Residence, which delicately bridges an arroyo in the middle of the desert in Cave Creek. Johnson posits that whenever you are designing a building for the open desert, it needs to be like a model that you drop down on the landscape, without changing anything around it, out of respect for the desert. And the Ellsworth Residence is a shining example of this philosophy as it lightly sits on the earth in its simple linear form with minimal disturbance of the site. Even though Johnson says that inspiration is “something that inadequate architects babble about,” the inspiration behind this house is clearly the adoration of the desert it inhabits. For example, the only landscaping that Johnson added as part of the house was revegetation, in keeping with the idea that the desert is an esteemed host and should be respected and left undisturbed as much as possible. The house sits on a 5-acre site that was bisected by a wash. Johnson happens to live next door and was familiar with the site long before it was purchased by David Ellsworth, who commissioned him to build a house on it. Johnson had thought from the beginning that if he ever designed a house on the site, it would have to bridge the wash, and so it came to pass, years later. Ellsworth, who has had a deep appreciation of the Arizona desert ever since he was a teenager, fell in love with the site and became friends with his new neighbor, Johnson, who later became the architect of his house. Johnson deplores the trend by architects, even the good ones he adds, that are so concerned with what a building looks like on the outside that the interior suffers. How often, he asks, do you stand outside your house and gaze at it? Not very often, he says, because you spend most of your time inside it. He designs his buildings from the inside out, putting most of his attention on the interior experience, as opposed to the exterior surfaces. Instead of the “jewelry” on a building, Johnson is always concerned first and foremost with simplicity, the structure and the experience of the resident. A driving force behind the design of the house was to feel as if you’re inhabiting the desert, even when you’re inside the building. The north and south-facing glass facades connect the residents visually with the desert at all times. And the cantilevered outdoor patios allow you to physically interact with the desert as part of everyday living in the house. A strong influence on Johnson, and one that is readily apparent in the Ellsworth Residence, is Mies Van der Rohe. Just like in Mies’s work, the beauty in the Ellsworth residence lies in its scale, its proportion and the way it meets the desert floor. And just as with Mies, for whom God was in the details, God is in how the metal structure meets the ephemeral glass, and how the outdoor patios float just above the ground in the Ellsworth Residence. This utter simplicity combined with an almost worshipful treatment of the desert makes this house a transcendent architectural masterpiece. This incredible masterwork of architecture is currently for sale and is awaiting a new resident. For more information, please contact Scott Jarson at scott@azarchitecture.com.